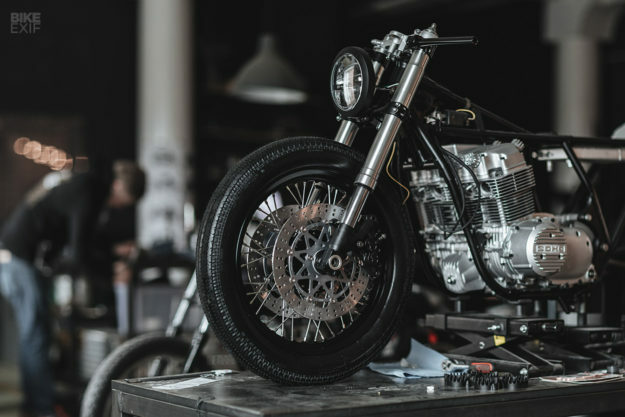 Hookie Co. are one of the most exciting new custom shops to have emerged in recent times. On the surface they’re a laid back and fun-loving crew—but deep down, they take their craft extremely seriously. Their latest work pays testament to their progression as designers and builders. 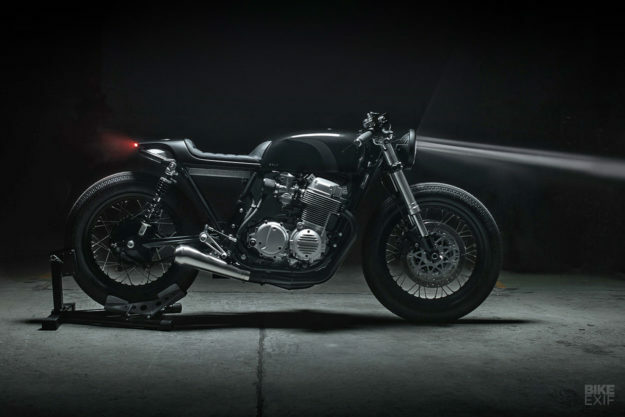 It’s based on the popular Honda CB750 K7, of the 1978 variety. 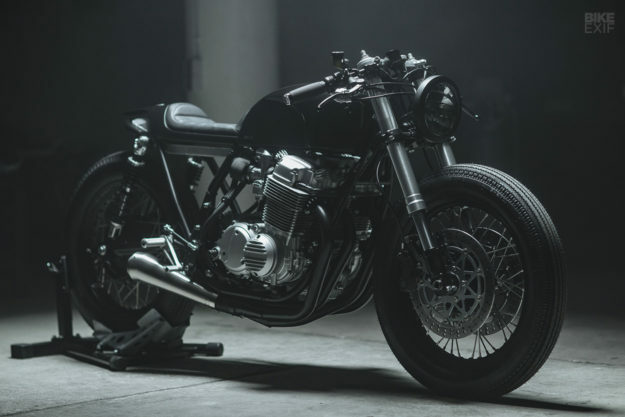 And while it cuts a similar silhouette to previous Hookie CB cafe racers, there’s actually a lot of interesting stuff going on. “This is a project that has been waiting on the ‘need to build’ list for almost too long,” says Hookie founder, Nico. Hookie traditionally name their bikes after animals; this one’s called ‘Wolf,’ and has the bite to back it up. For starters, the engine’s been rebuilt with an 830 cc big bore kit. It now breathes through a set of rejetted Keihin PD46 carbs, with pod filters and a new accelerator pump. Rather than black out the engine, the crew opted for a glossy silver finish. The finned covers are a neat touch, as are the black nitrided fasteners, which add a hint of contrast. The exhaust system is sublime; four-into-one headers coated in black, and exiting via a Spark muffler. To make sure all that power gets to the tarmac, Hookie have upgraded the chassis too. Up front are the upside-down forks from a Suzuki GSX-R. The back’s propped up on a set of custom-length YSS shocks. A new set of Sun Remo aluminum rims have been laced up to a Cognito Moto conversion hub in the front, and the stock hub in the rear. 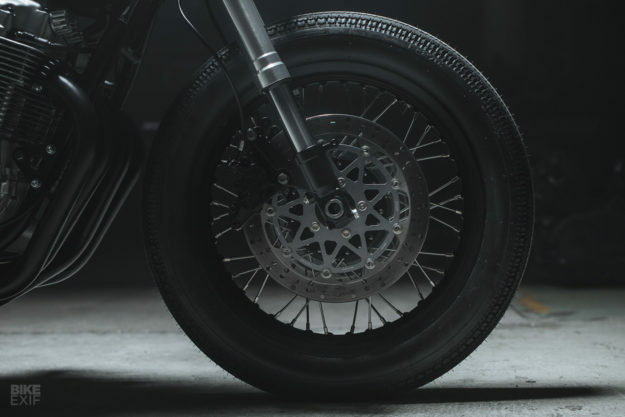 Hookie wanted classic tread—but not too classic—so they picked out a pair of TÜV-approved, and decent performing, Shinko SHR270s. 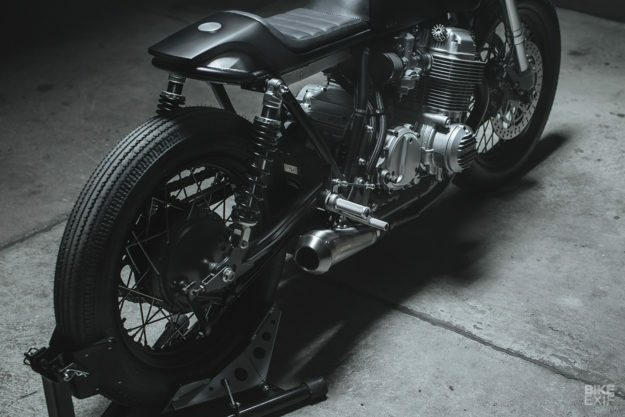 The rear drum brake’s had a full refresh, and the front’s been upgraded to a Nissin setup with an Accossato master cylinder. When it came to design, Hookie knew they’d need step things up a bit more aggressively than before. So the Honda’s new tail section is based on one of their existing designs, but with a twist. 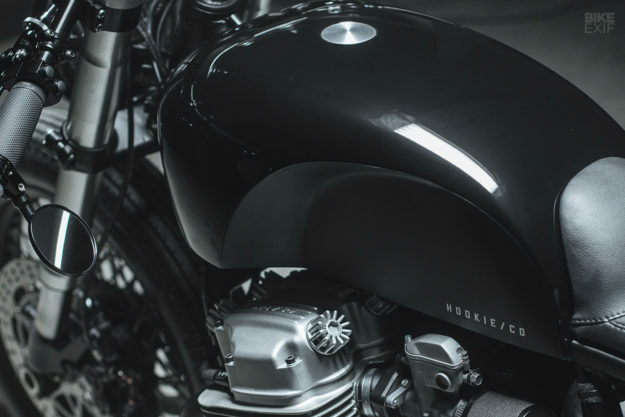 A rear cowl with a built-in LED taillight ‘hovers’ over an under-seat oil tank. Both are hand-made from aluminum, and there’s a pop-up filler cap on top of the cowl. The subframe’s been reshaped to match, and the entire frame’s been cleaned up and had its tabs trimmed off. 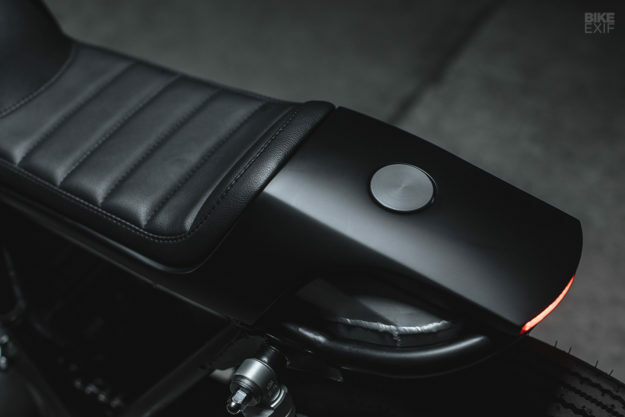 The fuel tank’s custom too, with sharp knee indents to help keep the rider tight to the bike, a pop-up cap to match the oil can. The ‘Wolf’ is more than just a reskin though. 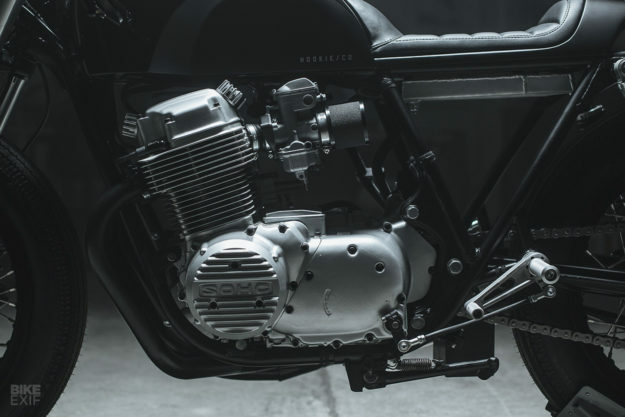 Under the hood, it’s running a completely new wiring harness, with a lithium-ion battery stashed under the swing arm. 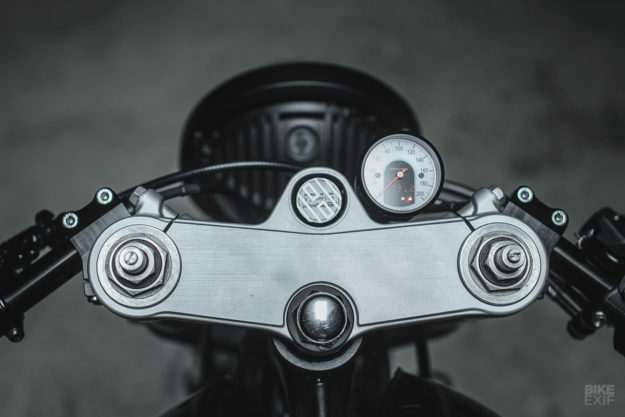 The system runs off a Bluetooth-enable Motogadget m.unit Blue, and features an upgraded electronic ignition. The cockpit’s sporting a grocery list of Motogadget bits, including switches, a speedo, bar-end turn signals and a keyless RFID system. The latter is embedded in the top of the triple clamp, where a regular ignition would normally go. 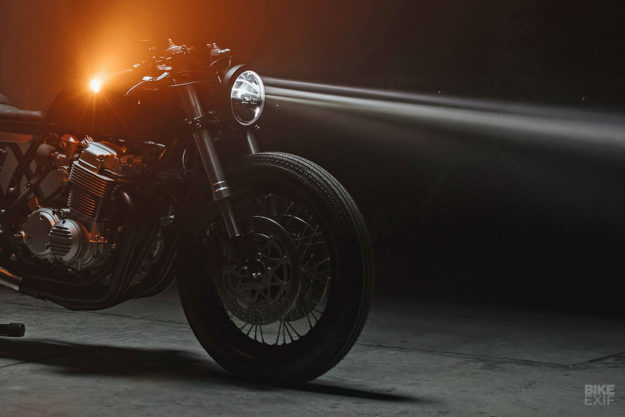 You’ll also spot new clip-ons, and a ‘Whiskey’ throttle and grips from Biltwell. The foot controls are a modded set of Tarozzis, while a powerful LED headlight from TruckLite lights the way. 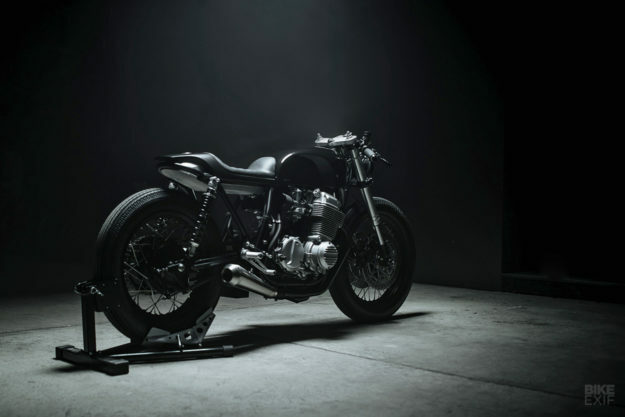 Adrian Flor handled the paint, shooting the bike in glossy and matte black, with metal flake silver accents. It contrasts superbly with the raw aluminum and silver touches. And that’s Hookie in a nutshell: a perfectly judged livery, flawless stance and all the right bits upgraded. Luckily for us, we’ll get to see (and hear) Wolf in the wild. Because it’ll be at the Wildays show in Parma, Italy, from the 1st to the 3rd of June, as part of the Bike EXIF display. See you there?